It is a well-known fact that our climate is changing rapidly. The global temperature has increased by 1oC over the last half century and 2016 was the warmest year since the beginning of global temperature measurements in 1880. This human-induced long-term temperature increase eventually results in a sea level rise. Remote Sensing is thé tool to help detect and monitor the effects of sea level rise at global scale. Earth Observation satellites have been collecting valuable observations since the early 1970s. By applying water detection algorithms to harmonised satellite datasets, we can retrieve useful information on the amount of submerged land in coastal areas. Climate model projections summarised in the IPCC Fifth Assessment Report (2013) indicate that the additional global sea level rise until 2100 is likely to be 0.25 – 0.80 m. Recent research has revealed that the Antarctic ice sheet is more vulnerable than previously considered. An additional 1 m or more sea level rise is expected from the breaking and melting of Antarctic ice cliffs. Although a few meters sea level rise may not sound dramatic, one should keep in mind that several densely populated areas are located in major river deltas at only a few meters above sea level, such as the Nile Delta, Brahmaputra-Ganges Delta, eastern China, Indonesia, the southern USA coast, etc. Satellite observations dedicated to quantify global sea level rise are invaluable for climate monitoring and climate model data assimilation. By harmonising Earth observation data of the numerous satellite platforms that have orbited our planet since the early 1970s we can detect and monitor global sea level rise and even forecast natural changes. Using Near- and Short-Wave Infrared observations, water can be delineated from land. 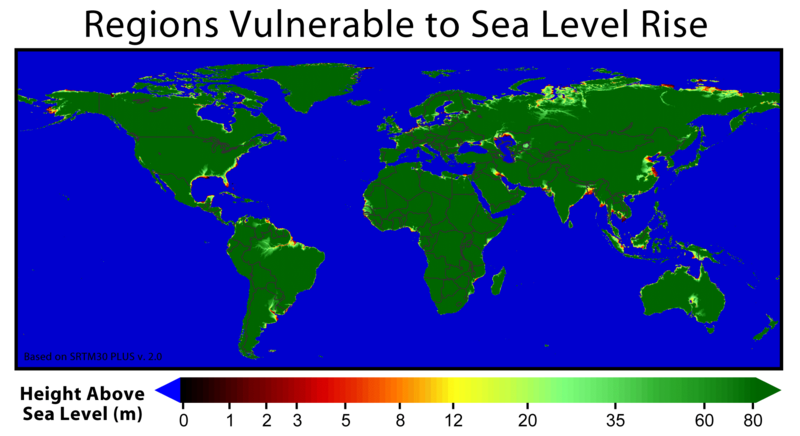 Spanning more than 40 years, these data can further evidence the global sea level rise impacts in vulnerable coastal areas. Combined NASA satellite observations show a global sea level rise of almost 9 cm from 1993 – present (source), which is about 3 mm yr-1. To showcase the potential of EO data, we did the test with PROBA-V observations. 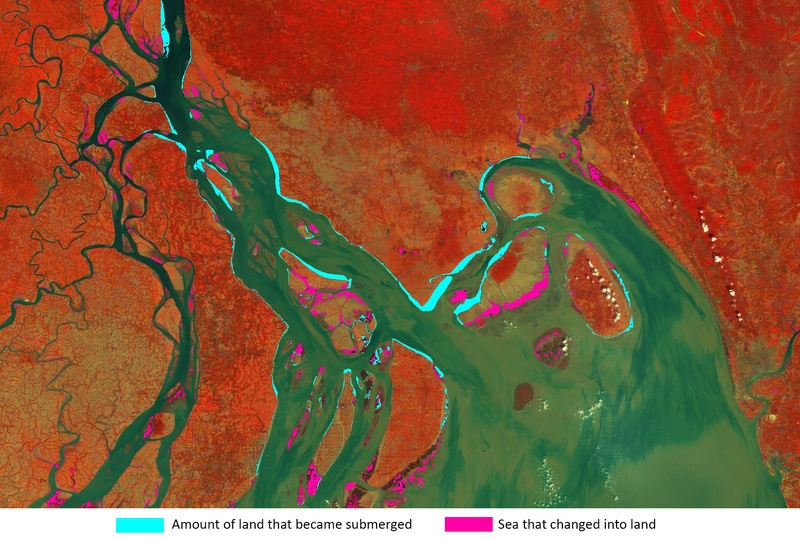 We used PROBA-V 100 m data to detect the amount of land that became submerged (light blue) and sea that changed into land (purple) over part of the Ganges-Brahmaputra delta between 2014 and 2017. It is noted that the period over which this map was made is too short to attribute any land loss solely to global sea level rise, but it shows the potential application on combined multi-decadal satellite datasets. Since the early 1970s, a vast legacy of satellite observations have been collected by Earth Observation satellites. Harmonisation of these past, present, and future satellite datasets (e.g. NOAA AVHRR, MODIS Aqua/Terra, Landsat, MERIS, SPOT-VGT, PROBA-V, Sentinel 2/3) will enable the long-term monitoring of global sea level rise in vulnerable coastal areas over multiple decades and will therefore be useful to evidence global sea level rise impacts. VITO Remote Sensing has a long-lasting experience in the processing, quality control, and application of satellite observations that dates back to the SPOT-VGT era in the late 1990s. With our expertise, experience, and processing capacities, we can contribute to an increased understanding of this and other climate change impacts. Also worried about climate change? Do you have a fresh, innovative or bold idea to address climate change? Do you want to take this idea into actions? Or do you want to develop your own business with it? Then you should participate in ClimateLaunchPad 2017, worldwide the largest competition for innovative cleantech ideas. Participants from more than 30 European countries will compete to gain first place in this challenging competition. Register your idea now and maybe you’ll win € 10 000 to startup your own business. Check the ClimateLaunchPad 2017 website for more information and deadlines.